Playwright Javon Johnson explains: "This is a warm, joyous, hymn-filled show that bears witness to the trials and triumphs of the African-American church. The project set out to explore the traditional world of gospel music and how it has been twisted, turned, and constantly revolutionized by the hip-hop and the R&B sound." 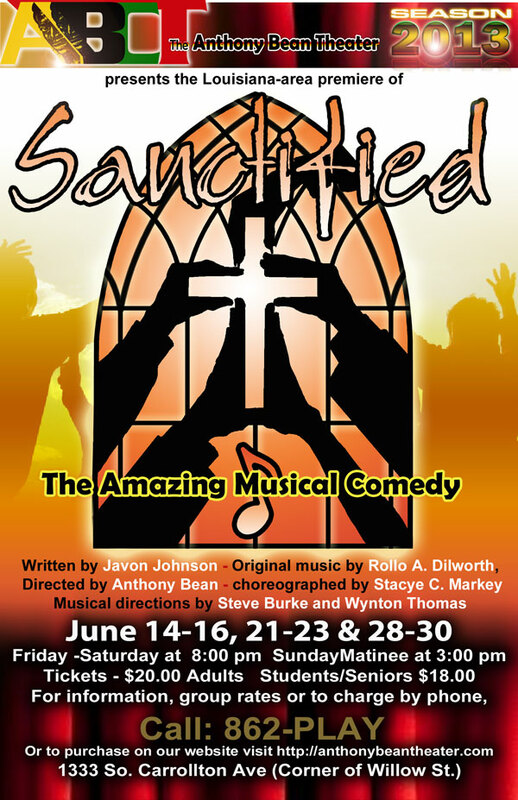 Sanctified tells the story of The East Piney Grove Baptist Church which has fallen on hard times and their last chance maybe their upcoming gospel revival. Desperate, the young and ambitious new Pastor calls in his cousin the diva of all divas for backup, but the elders arent having it! This hilarious gospel comedy opens a window to the African American church, gospel music, and the congregations that sustain it. This is a warm, joyous, hymn-filled show that bears witness to the trials and triumphs of the African American church. Featuring Roscoe C. Reddix, Donna King and Mychael Thompson. The cast also includes Joshua Kagler, Yolanda Cephus, Semaj Lumar, Asia Nelson and Shelita Burke Manual, Steve Burke, Wynton Thomas and Sean Jones.